In the first quarter of 2019, the volume of cargo transportation via the Baku International Sea Trade Port exceeded 1.03 million tons, Trend reports with reference to the port. During this period, 13,788 railcars were transshipped via the new ferry terminal, located in the Alyat settlement (a 12.6 percent increase compared to the same period last year). At the same time, 6,446 railcars (46.8 percent) were transshipped in the Baku-Kuryk-Baku direction, while 7,342 (railcars 53.2 percent) were transshipped in the Baku-Turkmenbashi-Baku direction. This is while 6,543 high-capacity vehicles (TIR) ​​were transshipped in January-March this year (a 43.5 percent increase compared to the same period last year). Thus, 5,180 high-capacity vehicles (79.2 percent) were transshipped in the direction of Baku-Kuryk-Baku and 1,363 high-capacity vehicles (20.8 percent) were transshipped in the direction of Baku-Turkmenbashi-Baku. The cargo handling potential of the Baku port within the first phase is 15 million tons, including 100,000 containers per year. Seven berths, out of 12 existing ones, serve dry cargo vessels, two berths serve ferries, while two more berths serve vessels of the Ro-Ro and Ro-Pax type. 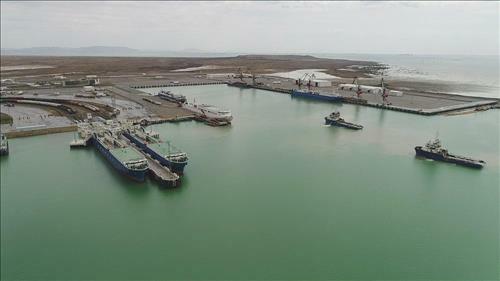 One more berth is used to serve the towing and auxiliary vessels of the port.